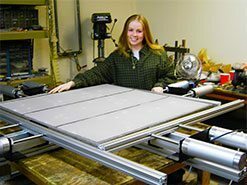 AFF has added new precision power stretching equipment in order to expand its production capabilities for re-screening most Great Western, Sweco, Kason and other adhesive bonded screen frames. Tighter, more uniform fabric tension increases product throughput and more accurate control of particle sizes. Improved adhesives increase screen durability. 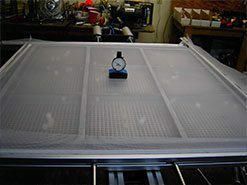 Most frames up to 4 ft x 4 ft using stock synthetic and stainless steel fabrics can be completed in one day, in house which means less down time for you. 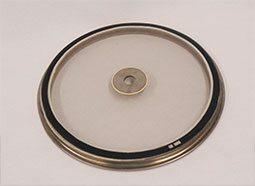 AFF round and pre-tension screens are produced in a temperature controlled environment to fit all OEM equipment. 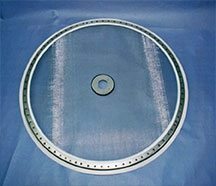 Years of research and development have enabled us to cultivate an effective method of even and efficient tensioning of both metal and synthetic wire cloth, either epoxied or spot welded.